Package tickets separatelyWe package them separately from your bars, so you can insert them. Assemble in chocolate bars, package separatelyWe insert them in your bars and package those bars separately so you know which have tickets. Assemble in chocolate bars, randomly mixWe insert them in your bars and randomly mix with your other bars so you don’t know which bars have tickets. Usually ships in 6-8 business days, free shipping available. 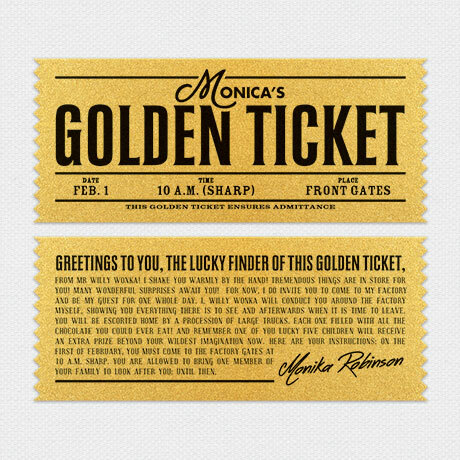 Printed on metallic gold shimmer paper, double-sided and die-cut for an authentic look, our personalized Golden Tickets are an ideal add-on to your personalized chocolate bar wrappers. Include a ticket under your wrappers and use them as party invitations, entry for a special event, or as prize winning tickets for the lucky recipients. The golden ticket measures 1.875 inches x 4.5 inches and fits perfectly under your candy wrapper as a special surprise. Tickets are printed in black ink on both sides of a premium metallic shimmer paper with die-cut zig-zag ends. *Add On Item: Must be ordered with WhimsyWraps wrappers or chocolate bars. If you wish to purchase the tickets separately, please contact us for pricing and details. Design: An authentic design printed in black on printed on metallic gold shimmer paper. Personalization: Name, date, time and place on the front, message on the back.